The GPS unit said I was about there. So I tucked it back into my pocket and started looking around. 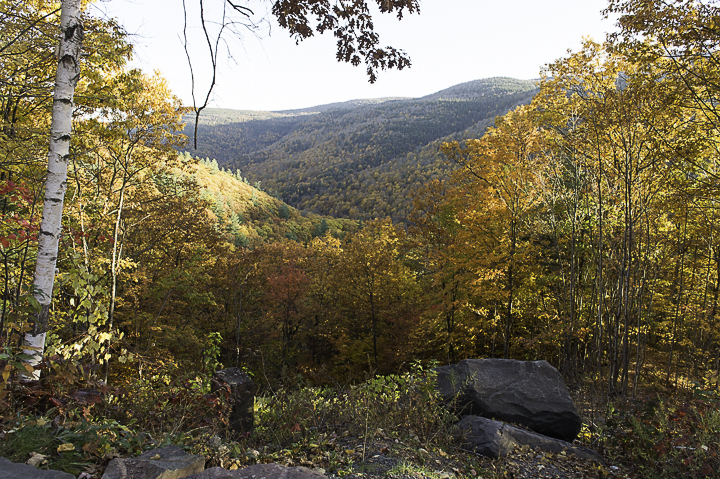 I was on the Long Path on the top of the Palisades, near a kind-of-hidden rock ledge overlooking the Hudson River. It was a late summer-early fall morning, still kind of warm, and decent weather for a hike. On this particular morning, though, I wasn’t on a full-length hike. 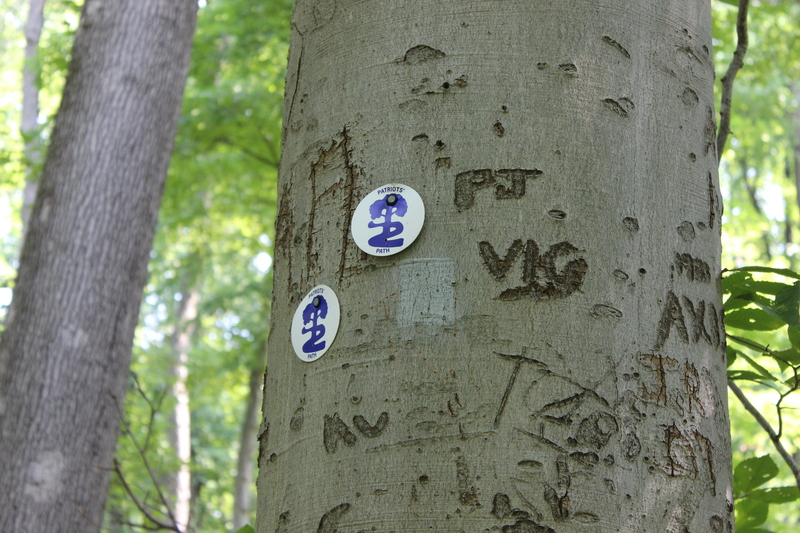 I was there on a geocache run. I’d keyed in the cache’s coordinates, and the clue that I was given said to look for a boulder, with your back facing the river. So I start scanning. There are some rocks that are certainly big enough to qualify as boulders, but none of them, as far as I can see, have any crevices or gaps big enough to stash a cache. After a few minutes, I stepped out onto the ledge itself to get another look at the area. I lay down, on my stomach, to get a better look and…bingo! I used my hiking pole to pull the chunk of asphalt, and the cache container (a plastic box about six inches square) it was holding in place, toward me. 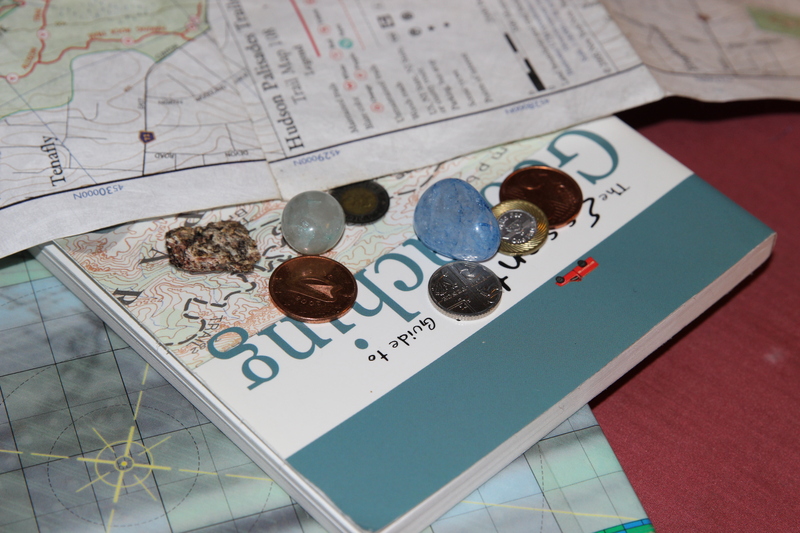 It had the usual contents – plastic jewelry, business cards, a Scout badge, a few coins, etc. I added a bookmark to the cache and poked it back into the crevice for another searcher to find. Blazes for the Patriots’ Path. What was it, exactly, that enabled the Continental Army to win the Revolutionary War? Depends on whom you ask, I think. The historians and the primary school history books will probably say it was bravery, honor, intelligence – the usual stuff. Personally, I think that America’s birth as a nation depended a lot on a good set of calf muscles. 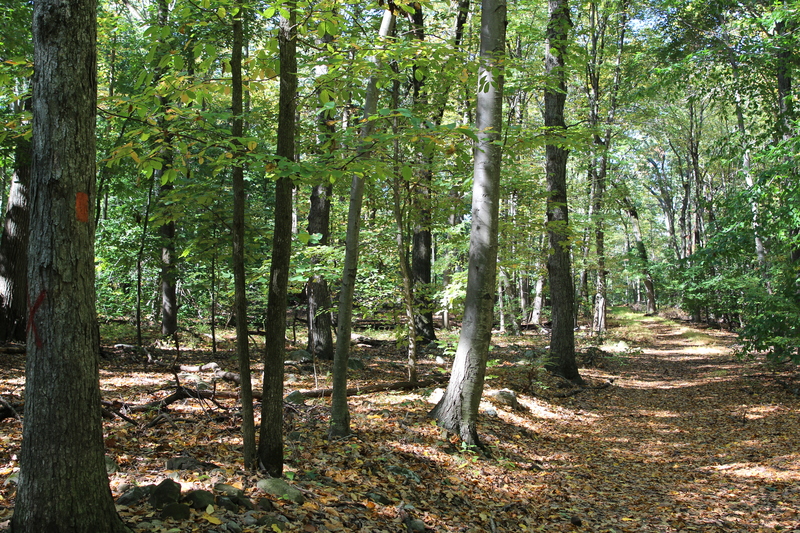 And if you’ve ever hiked along some of the trails in the Morristown National Historic Park in central New Jersey – the Continental Army’s stomping grounds in the late 1770s – I think you’d agree. Some of the hiking trails there are a nice easy amble. But others – they’re a bit of a push to get up. So imagine, if you will, a soldier in 18th century uniform marching uphill with musket and powder horn. And this was a thought that was crossing my mind once or twice when I went for a hike on the Patriots’ Path on one of my days off this summer. View from the North Loop in Mount Nemo. 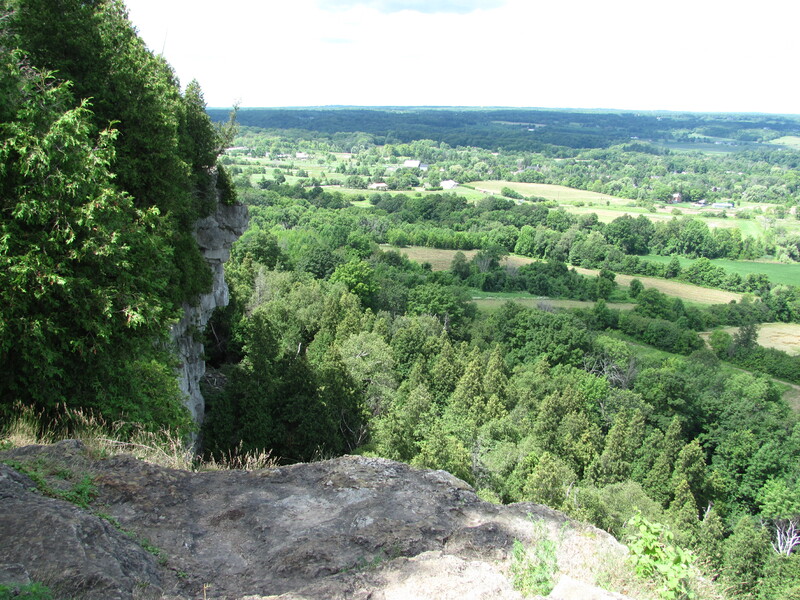 During a trip to Toronto and central/southern Ontario a few years ago, we decided to work in a hike at Mount Nemo, up along the Niagara Escarpment. 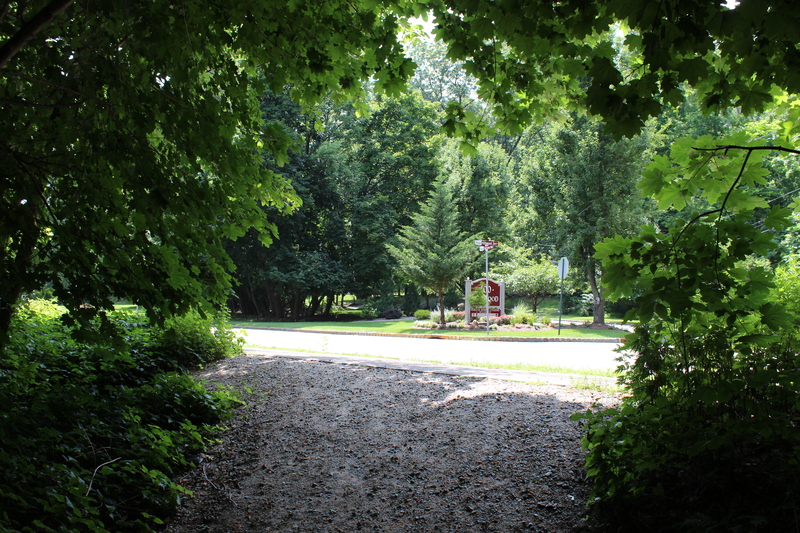 So on day four of our trip, a Saturday morning, we piled into the car with backpacks and hiking boots and headed west out of the city toward Burlington. It was a gorgeous day – blue skies, lots of white puffy clouds. It was August, so the weather was warm, but not brain-cripplingly so. Simply put, it was perfect hiking weather. 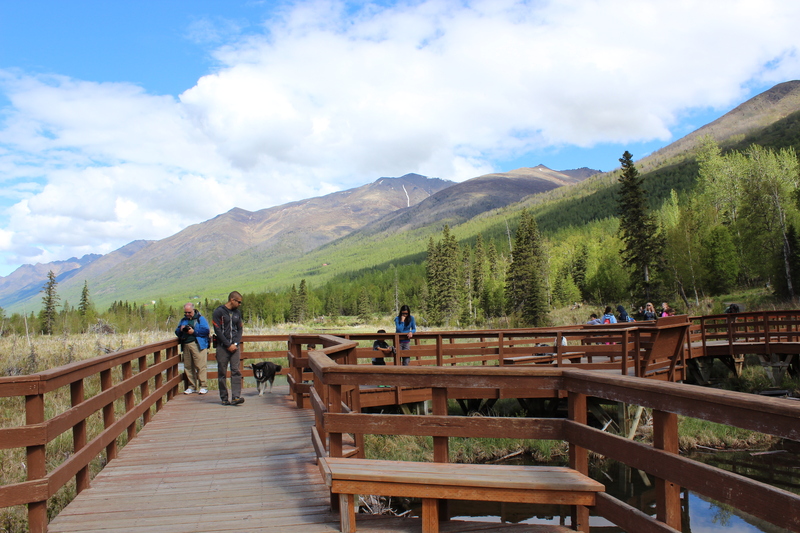 And there were quite a few other hikers out taking the trails that day as well.